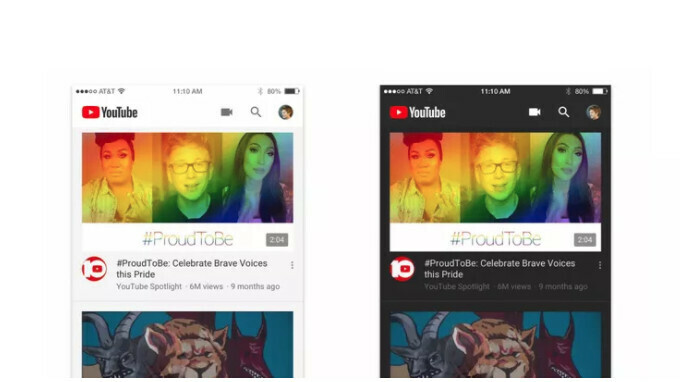 YouTube for iOS updated with dark mode, Android version to get it "soon"
It looks like Google is in the process of rolling out a new update for the YouTube app, which will add a new dark mode, similar to the one that's been released on desktop last year. Nothing else seems to have been implemented except for this new dark theme, but one thing that's worth mentioning is the update will only be available to iOS users initially. The folks over at The Verge report Google plans to introduce the dark mode to the Android version of YouTube “soon.” In case you're wondering why a Google service is getting a new feature on iOS before Android, we can't really tell why is that happening in this case, but it's probably related to the fact that YouTube has two different teams handling development for the two platforms. It remains to be seen when exactly YouTube for Android will get the new feature, though we kind of expect it “to go dark” in the next couple of weeks. If you read carefully which you probably didn't, you'd understand why. Even though PhoneArena's source (The Verge) is only guessing as to why iOS is getting it before Android.. albeit being an educated guess, Jrod99 can still ask why since we didn't get any confirmation. This. It's easier to develop on iOS which is why they have it first the same reason why it takes time on Android as you have to support different versions of Android (android 8.0 is still in a very small percentage). But I'm also having an idea that Google is trying their best to make their Google apps on Apple work well on iOS (Google now works natively on ipad now then this news) so it would sway some iOS users to Android plus one of the main Goals of Android P is to cater to iOS users and make the switch to them (Android P inspired by iOS). The superior, more sophisticated OS always gets the updates first. Its ok though. You'll get your android update soon. Typical Google catering to the Apple girls which is exactly who they wish they were. Google will never be Samsung or Apple no matter how much time they spend on their knees at Cupertino. It's in Google's best interest to do this since their portrait mode looks horrendous with the unibrow cutout. Dark mode will hide it effectively without violating apples requirements to show the unsightly design. That has nothing to do with my comment but thanks for your input! Dark theme looks like dirt. It's either pure black or simple white. I have been developing my own apps with Android studio for a year now, and find it easier than swift.... maybe it's just me. Talk about dangling the carrot. We've been talking about the dark mode in YouTube for at least a year.